Ion channels are important drug targets. A young team of researchers led by pharmacologist Anna Stary-Weinzinger from the Department of Pharmacology and Toxicology, University of Vienna investigated the opening and closing mechanisms of these channels: for the first time the full energy landscape of such a large protein (> 400 amino acids) could be calculated in atomic detail. The scientists identified a phenylalanine, which plays a key role for the transition between open and closed state. The time consuming calculations were performed using the high performance computer cluster (VSC), which is currently the fastest computer in Austria. 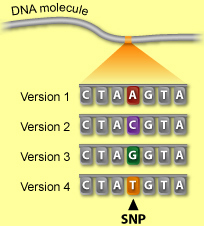 Recently, the results were published inPLOS Computational Biology. Every cell of our body is separated from its environment by a lipid bilayer. In order to maintain their biological function and to transduce signals, special proteins, so called ion channels, are embedded in the membrane. Anna Stary-Weinzinger and Tobias Linder from the University of Vienna and Bert de Groot from the Max Planck Institute of Biophysical Chemistry in Göttingen identified a key amino acid (phenylalanine 114), which plays an essential role for opening and closing of these ion channels. A conformational change of phenylalanine triggers opening of the channels. Ion channels are important drug targets. 10 percent of current pharmaceuticals target ion channels. A detailed understanding of these proteins is therefore essential to develop drugs with improved risk-benefit profiles. An important basis for drug development is a detailed knowledge of the functional mechanisms of these channels. However, there are still many open questions; especially the energy profile and pathway of opening and closure are far from being understood. 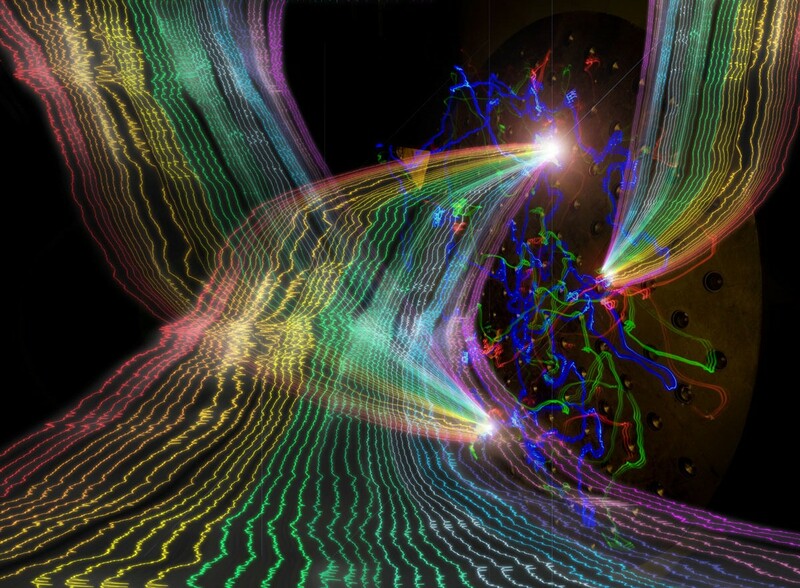 To watch these fascinating proteins at work, molecular dynamics simulations are necessary. Computational extensive calculations were performed with the help of the Vienna Scientific Cluster (VSC), the fastest high performance computer in Austria, a computer cluster operated by the University of Vienna, the Vienna University of Technology and the University of Natural Resources and Applied Life Sciences Vienna. With the help of VSC, the free energy landscape of ion channel gating could be investigated for the first time. The young researchers discovered that the open and closed channel states are separated by two energy barriers of different height. Surprisingly, the dynamics of a specific amino acid, phenylalanine 114, are coupled to a first smaller energy barrier. “This side chain acts as molecular switch to release the channel from the closed state,” explains Tobias Linder, PhD student from the University of Vienna. After these local changes, the channel undergoes large global rearrangements, leading to a fully open state. This second transition from an intermediate to a fully open pore is accompanied by a large second energy barrier. This research project is financed by the FWF-doctoral program “Molecular Drug Targets” (MolTag), which is led by Steffen Hering, Head of the Department of Pharmacology and Toxicology of the Faculty of Life Sciences, University of Vienna. The above story is based on materials provided by University of Vienna. Lysosomes are the recycling system of the cell. They are small membrane-limited vesicles that contain 50-60 hydrolytic enzymes that are most active around pH 5. They take up old mitochondria, membrane, ribosomes, peroxisomes, lots of things like bacteria that come from outside the cell, individual cytosolic proteins, and they dismember them into their monomeric components. Proteins are broken down to amino acids, polysaccharides to simple sugars, lipids to fatty acids and glycerol, and nucleic acids to nucleosides. Sulfate and phosphate are hydrolyzed from sugars and proteins. These monomeric subunits then escape into the cytoplasm through specific transporter channels and can be reused by the cell to synthesize new macromolecules. Lysosomal recycling is the ultimate response to starvation, and permits a cell to destroy certain components in order to replace and repair others essential for survival. Several different methods are used for substrates to enter lysosomes. (1) fusion with an endosome. (2) fusion with a phagosome. (3) entry of some proteins through the membrane. (4) If digestion of a cellular organelle is to occur, a unique mechanism utilizes the use of membrane segments of the RER. By unknown stimuli, double membrane segments of RER membrane without ribosomes surround and engulf organelles like mitochondria and peroxisomes. The resulting structure has a double outer membrane, and is named an autophagosome. Digestion of the contents of the autophagosome follow its fusion with a lysosome. 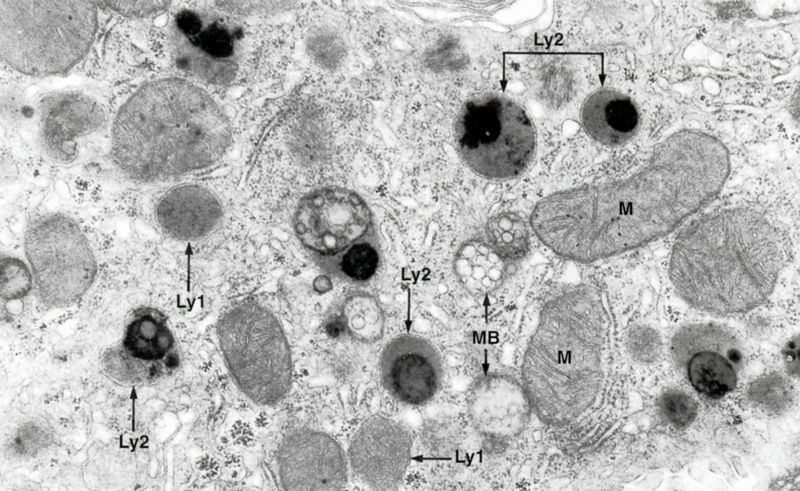 The lifetime of an autophagosome is only 4-8 minutes, and as a result they are seldom observed in electron micrographs of normal cells. 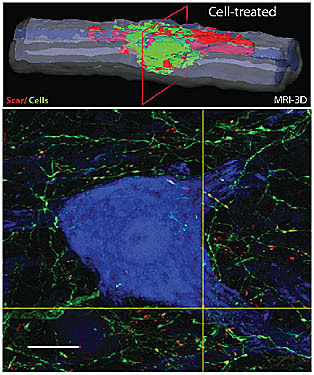 A three-dimensional, reconstructed magnetic resonance image (upper) shows a cavity caused by a spinal injury nearly filled with grafted neural stem cells, colored green. The lower image depicts neuronal outgrowth from transplanted human neurons (green) and development of putative contacts (yellow dots) with host neurons (blue). A new study has found that a single injection of human neural stem cells produced neuronal regeneration and improvement of function and mobility in rats impaired by an acute spinal cord injury (SCI). The human stem cells appeared to vigorously take root at the injury site and produced an array of therapeutic benefits. A 3-D, reconstructed MRI (upper image) shows a cavity caused by a spinal injury nearly filled with grafted neural stem cells (green). The lower image depicts neuronal outgrowth from transplanted human neurons (green) and development of putative contacts (yellow dots) with host neurons (blue). 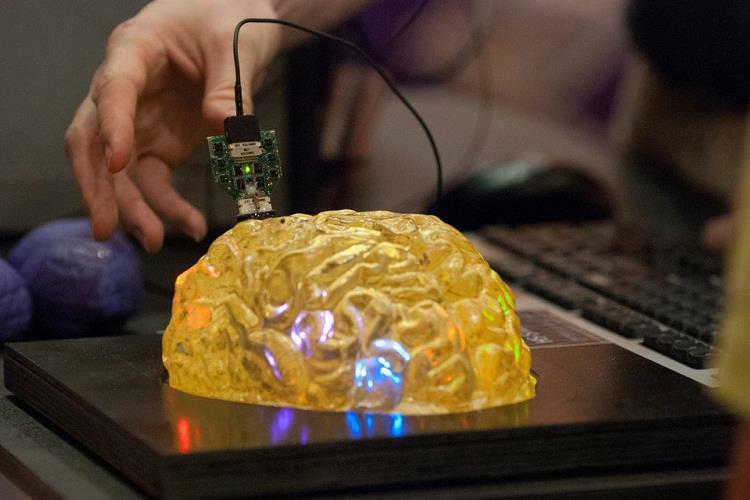 At the recent meeting of the American Association for the Advancement for Science in Boston, neuroscientists outlined several lines of promising Brain–computer interface research. 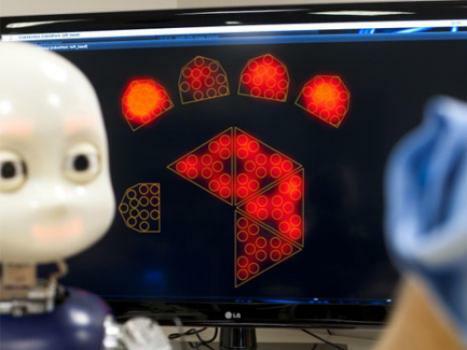 Advances in microprocessors, computing, and materials science, for example, have facilitated the development of “epidermal electronics,” which combine wireless communications, neural sensors, and other medical sensors into patches small and flexible enough to serve as temporary tattoos. People suffering from autism spectrum disorder, attention deficit-hyperactivity disorder, bipolar disorder, major depressive disorder, and schizophrenia have at least four genomic elements in common, according to research published last Wednesday (February 27) in The Lancet. 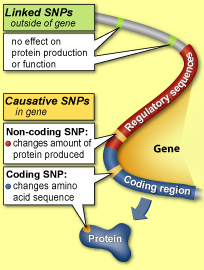 Researchers combing the DNA of more than 60,000 people around the world determined that the five disorders were linked by single-nucleotide polymorphisms (SNPs) that occur in at least four different spots on the genome: two in regions of unknown function and two in key calcium channel subunit genes. Though the four SNPs confer only a small risk of developing the psychiatric disorders, the study is the first to identify genetic elements that link such a wide array of pathologies. Nevertheless, the findings—especially the shared SNPs in genetic components of calcium channels—give hope for an eventual therapy to treat all the disorders. “The calcium channel findings suggest that perhaps—and this is a big if—treatments to affect calcium channel functioning might have effects across a range of disorders,” Smoller told the NYT.